AUTONET — a look into the future. November 1, Avrora Robotics took part in the international forum of innovative transport technologies «Avtonet». 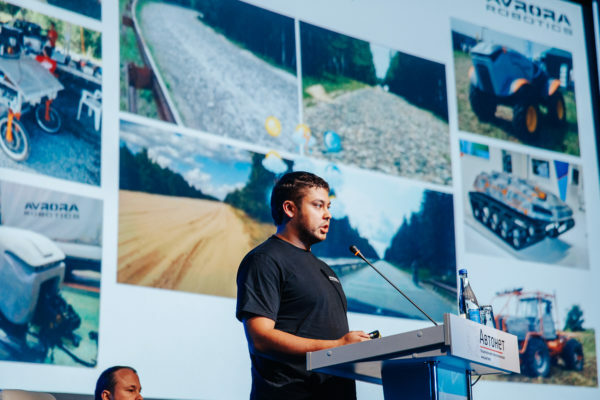 About a thousand representatives of leading companies in all areas of the automotive business became honored guests of the event, one of which was Avrora Robotics CEO Vitaly Saveliev, who presented to the public his own vision of the prospects for the development of unmanned vehicles. The Avtonet Forum has become one of the most significant events for specialists in the field of advanced technologies, as well as the promotion of new services used in the field of innovative modern transport systems, such as: GLONASS, ASI, Avtodor, Yandex, Rostelecom.